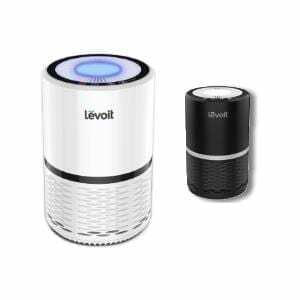 Home » Buyers guide » Levoit LV-H132 Vs GermGuardian AC4825 – Which One Should You Buy? If you’re here there’s a good chance you’re know how popular both models are. 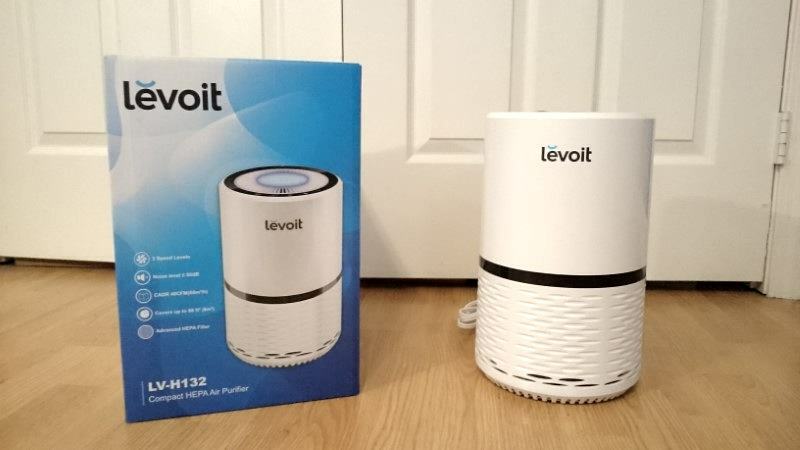 Both Levoit and Guardian Technologies produce some of the best air purifiers sold today. As it turns out, it’s not as simple as asking which one is “best” – both have their pros and cons. Additionally, both have excellent buyer satisfaction ratings making it even harder to decide. 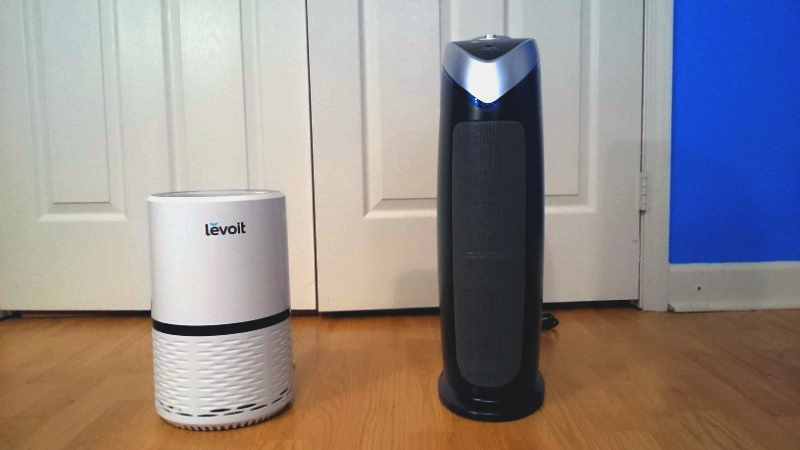 In my detailed Levoit LV-H132 vs. GermGuardian AC4825 comparison I’ll highlight what you need to know before buying. I own and have personally tested both! Which one is right for you? Read on and I’ll help you decide. 11. Which should you buy? Both models look quite a bit different from the outside but in fact share a lot of common features, performance, and build quality. And obviously there’s the significant size & styling differences to consider. But not to worry – both are great at what they do! I’m sure one will find a great place in your home. 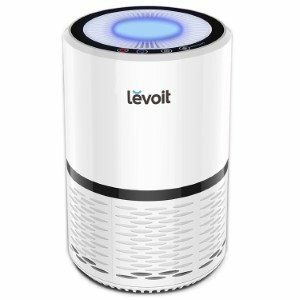 As far as air purifiers sold today go, two of the best-selling and most popular are without a doubt the Levoit LV-H132 and the GermGuardian AC4825 both occupy one of the most popular price segments over at Amazon. Both normally sell for below $100. 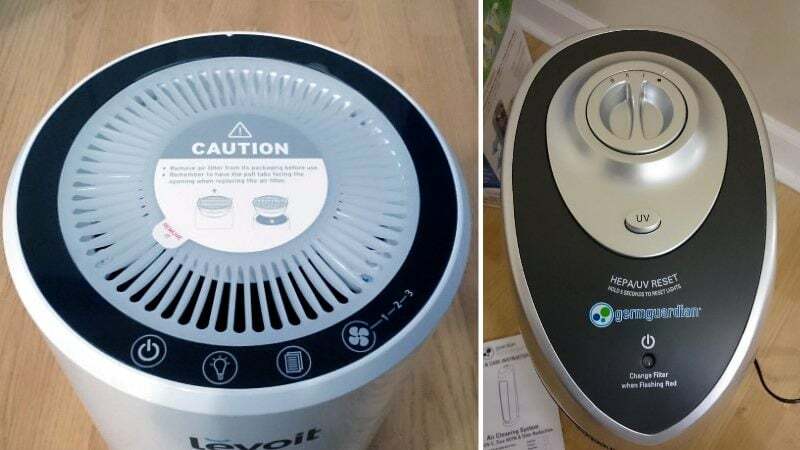 I’ve owned and have tested a number of air purifiers and still currently use my AC4825, but I’ve always been curious about the LV-H132 and wanted to compare the two. 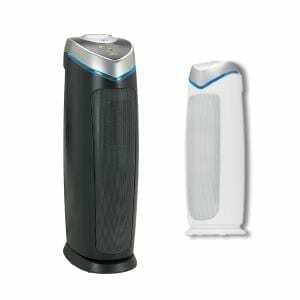 Both models are HEPA filter-based models which work with a pre-filter and active carbon filter to trap air contaminants, odors, and dust and hair. Additionally, both are pretty simple to operate I’m happy to report. In case you’re interested, I’ve written an extensive review of the GermGuardian AC4825 I own here. However, there are definitely some important differences between the two to be aware of. This is definitely not a case of “one is better than the other.” Both have strengths and weaknesses, meaning one will be a better fit in your home than the other. Let’s dig into the specifics, shall we? Here are the specific differences to know between both models. Note that the LV-H132 has a significantly lower Clean Air Delivery Rate (CADR) and also doesn’t feature a UV-C germ killing feature, both of which I’ll cover in more detail later. The Levoit LV-H132 is a compact and good-looking model with top-mounted controls. Unlike the GermGuardian AC4825, the filter is located on the bottom (as opposed to the rear). It’s well-made and looks great. Note that it's now available in black as well! 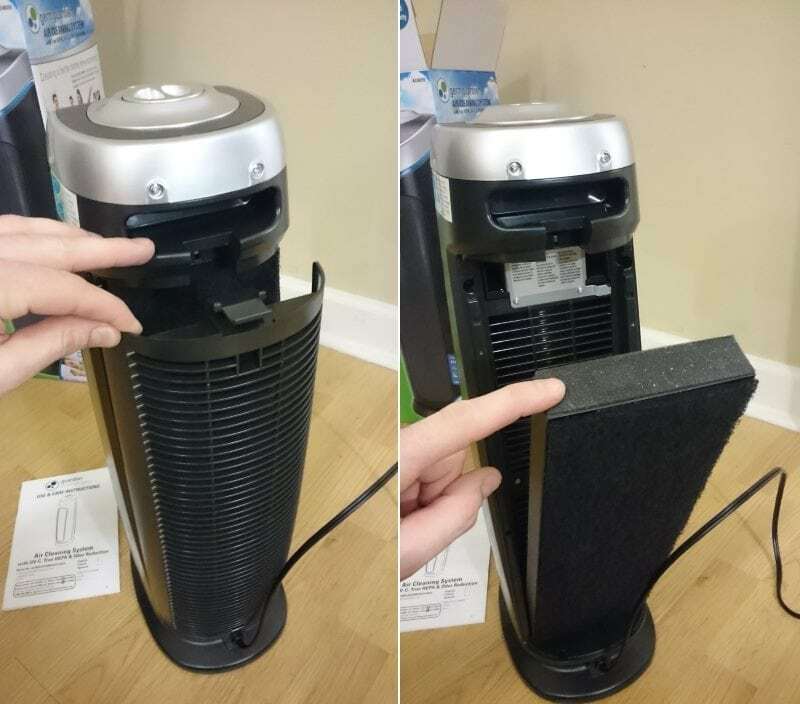 Replace filters by turning the unit upside and removing the bottom cover (see below for more details) and are normally replaced by inserting a new all-in-one filter cartridge. 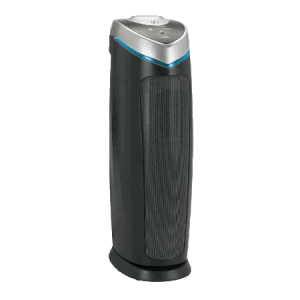 The Clean Air Delivery Rate (CADR) is much lower than that of the GermGuardian AC4825, but one reason for that is its rated at about 86 square feet coverage. Also, the ultra-quiet operation means a lower fan speed so that’s to be expected. Finally! I’ve admired the LV-H132 for a long time and while I love my white one, the newly available black version is even better looking! One of my long-standing complaints about the LV-H132 was the lack of an alternate color. It’s a great-looking purifier – don’t get me wrong, but I personally love an alternate color choice. The great news is that Levoit now offers the same model in a fantastic-looking black version! Ideally targeted at small to medium-sized rooms, it’s a great choice for a bedroom or any other small room. The air purification effectiveness is very good in my experience. It also has one of the best carbon filter sections I’ve seen. A good active carbon filter is effective at trapping odors as well as volatile organic chemicals (VOCs) in the air you can potentially inhale. There’s a handy filter replacement reminder built-in as well. At about 14.5″ (36.8 cm) tall, it’s still very compact and a quite a bit shorter than the GermGuardian model. I like the compactness, but it comes with a trade off as I’ll tell you later. 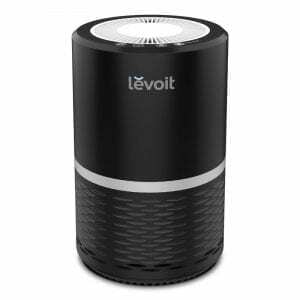 One advantage you’ll have with the Levoit is the memory feature. Unlike the AC4825, turning it back on restores it to its previous settings for fan speed and night light. That’s a nice touch a like. I’ve had some time to test and try the LV-H132 and I have to say it’s very well-made. The fit and finish are excellent and obviously some thought was put into its design. Build quality is good, with solid construction and great fit and finish. All around, it gives off a great impression of a great purifier that’s a quality contender. The LV-H132 has a night light button with 2 brightness levels to choose from. While it’s a nice feature to have (it definitely provides lots of light in the room) my gripe is that the low setting is still very bright. If you’re sensitive to light when sleeping that may be a deal-breaker like it is for me. In that case, I had to leave it turned off. However, for parents and others who can really use the additional soft lighting affect, it’s a great option to have at your disposal. is a 22″ tall unit containing not one but two fan assemblies. It’s rated at a higher Clean Air Delivery Rate (CADR) of 100+ and is recommended for up to 167 sq. feet. The AC4825 also uses a 2-stage true HEPA filter assembly, but the similarities with the Levoit model end there. It uses manual (top-mounted) controls via a 3-speed rotary fan switch. 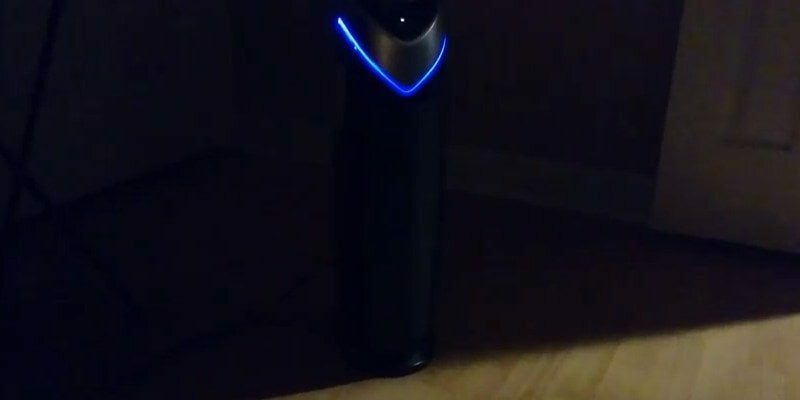 However, it does have a distinct advantage over the LV-H132: it’s one of the several GermGuardian models featuring a germ-killing ultraviolet light (UV-C) feature that’s optional. It’s very simple to use by engaging the push button control on top. When turned on, the purifier indicates this by illuminating the trim ring around the edge of the top section with a nice blue glow. For those who want additional protection against airborne illnesses it’s definitely a great feature to consider. I’d like to add it’s especially a great idea for those with babies or people prone to sickness, colds, and more. 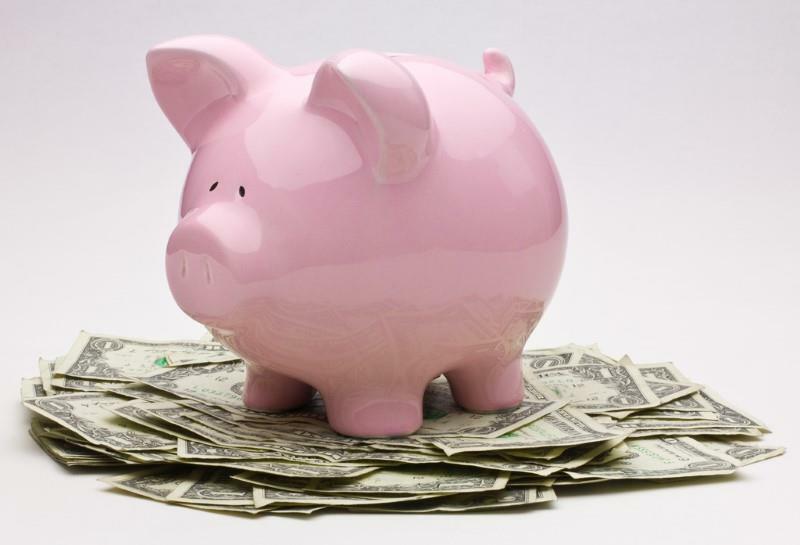 The HEPA filter is replaceable both separately from the pre-filter or as a single filter assembly, so it’s possible to save a few dollars if the HEPA filter section isn’t completely blocked up with captured particles. It also has a handy filter replacement reminder right on top where it’s easy to see. The AC4825’s stylish twin, the GermGuardian AC4900CA. It’s identical in performance and is essentially the same purifier in a different body. 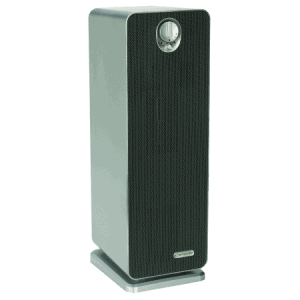 While the AC4825 isn’t available in an alternate color like the Levoit air purifier, it is available in another version called the AC4900CA. That’s a great model I also own, and it features a stylish brushed metal appearance finish and front-mounted controls. Both are identical in performance and operation. Ideally the AC4825 is well best for medium-sized rooms. However, it’s fine in small rooms if you’ve got the space. At about 22″ (~56 cm) in height, it definitely won’t fit in as many areas as the LV-H132). So bear that in mind when comparing. As I’ve owned my AC4825 for some time now, I can tell you it too has a great quality construction and is well-made. The finish is a great-looking satin black with a matte silver trim on top. Body parts line up well with no gaps or defects. It doesn’t feel cheap like some other products I’ve owned, and you’ll see what I mean when you get one in your hands, too. I’ve never had a problem or complaint with the build quality and I’m very satisfied with it! When in use, the AC4825’s UV-C germ killing feature produces a lovely, light glow throw the translucent trim around the base of the control top section. It’s not exactly a night light, but it does produce a small glow that provides a little bit of light, so it’s still somewhat useful in that regards. 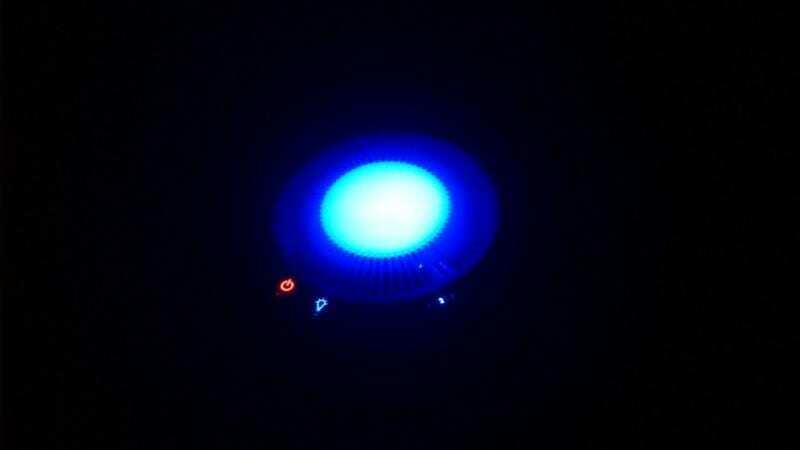 If you’re like me and are very sensitive to light when sleeping, you’ll have to turn it off before bed. However, others may really appreciate the additional benefit: not just killing germs and microbes in the air, but also a cool-looking glow at night! But how hard is it to check or replace the filter in both? Let’s have a look. Accessing the filter assembly on the LV-H132. 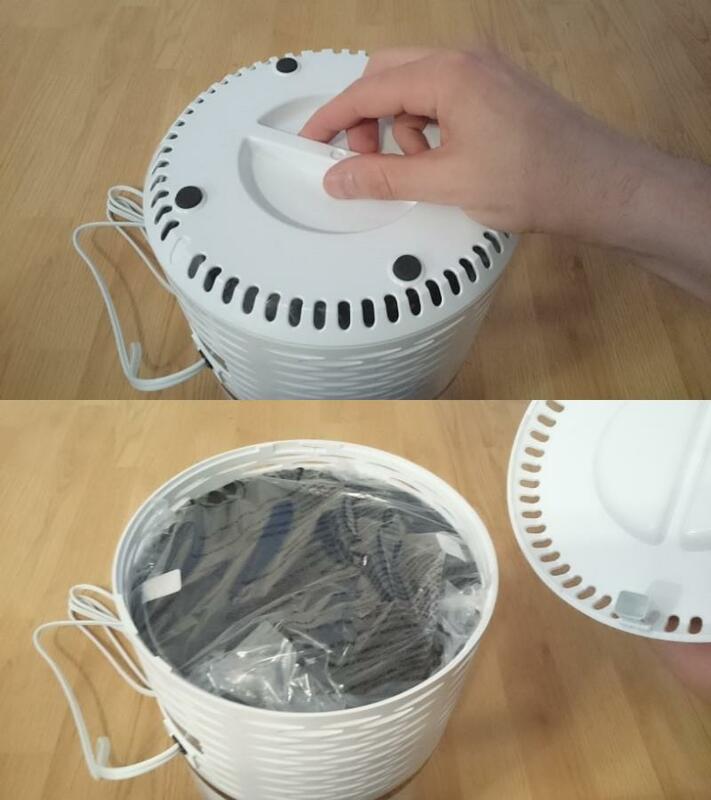 Note that the filter shown (in plastic bag) is what you’ll see when buying new. You’ll need to remove it from the bag before use, as it’s stored for safe keeping to the carbon filter portion fresh for use. All in all I found it pretty simple and straightforward, so no complaints here! The AC4825 has a simple rear cover with locking tab to open when you want to check or replace the filters. It’s very straightforward and works well. Likewise, the AC4825 is really simple as well. If anything, it may be just slightly easier to do, but it’s nothing significant. To remove the rear cover, push down on the release tab at the top, then lean the cover down. There are two bottom-mounted tabs keeping it aligned. Simply pull the cover outward and up, and it’s free. The filter assembly also leans out easily and is really simple to replace. Just pull out the old one and re-insert the new one. That’s it! You’re done. I don’t see any big advantages in one model over the other, so again there they’re quite similar, just different in design. Controls comparison for the LV-H132 and AC4825 models. The Levoit (left) uses touch-sensitive electronic controls which are a nice touch and work very well, if a bit sensitive. The AC4825 (right) has simple but good-feeling manual controls. It’s also extremely simple to operate and I definitely suggest it for those who aren’t comfortable with more electronic controls. There aren’t any major advantages between one or the other when it comes to controls. In my experience, they’re both great at what they do. Honestly, I feel like it comes down to personal preference in this category. The Levoit’s controls are clear and easy to use – very intuitive. They’re touch controls, so it’s easy to make a mistake and change a setting by accident, but in my experience that didn’t happen often. The fan speed control simply rotates through the 3 settings (low, medium, and high) so you just keep touching the fan symbol button until it’s where you need it to be. The night light feature (shown above as a light bulb symbol) rotates through the high, low, and off settings. One thing to note: the LV-H132 makes a beeping sound each time a button is touched. You cannot disable the beeping sound. That’s one drawback you need to be aware of. While it isn’t an irritant for many, for those who will be using it in a baby’s room or other quiet area it’s something to consider. I also found the AC4825 extremely easy to use. It’s an especially great choice for the elderly or others who prefer the touch and “feel” of a manual rotary controller. It feels solid and works well. Likewise, the push button germ killing switch is a “soft button” and also works great, with good feedback for your fingers. I can’t find any faults here either as well. The simplicity of the 3-speed fan control I’m sure will be appealing to both those who like more advanced controls as well as people who prefer uncomplicated products. Obviously, it’s cheaper to manufacturer basic controls which I’m sure contributes to the AC4825 being an overall good value (along with having more square foot coverage than the LV-H132. Expect to replace filters around 6-8 months after use, although that time varies greatly by use and the condition of the air in your home. For some, the HEPA filter’s life can be extended as long as a year! Both models have a separately replaceable pre-filter section, although for the LV-H132 that doesn’t include the active carbon section as well, which for the AC4825 it does. Expect to pay around $15-$25 for a complete filter replacement for the LV-H132 and around $27-$30+ for the GermGuardian model. Note that prices always vary from time to time and seller to seller. That being said, the Levoit does have an advantage here as far as filter costs go. You may be able to shop around and find 3rd party brands for less money for the GermGuardian, however. I’ve seen a few in my research. One thing to bear in mind is that owners (like me) of the AC4825 will eventually have to replace the UV-C bulb as well. 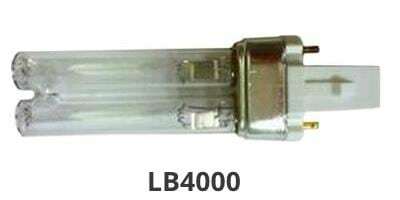 Shown: LB-4000 UV replacement bulb for the GermGuardian AC4825 air purifier’s germ killing feature. Rated life is about 12 months and you can expect to pay near $25. You’ll need to remove the rear metal cover (located internally in front of the filter) using a Phillips head screwdriver. It’s fairly simple to do and the owner’s manual provides clear & detailed instructions which I definitely like. In order to have some solid data to share with you, I measured the noise levels I heard. Using this great little digital sound level meter I bought at 1 meter (3.28 ft) from the purifiers I recorded the actual noise levels produced. What does this mean? The basic result is that the Levoit model is significantly more quiet during operation. As a matter of fact, on low and medium settings, it has to be one of the most quiet air purifiers I’ve ever heard! Don’t get me wrong: the AC4825 is quiet and the many happy buyer reviews back up my statement. However, the Levoit was even more quiet than I could have imagined. When it’s in use, it’s so amazingly quiet that sometimes you can’t even tell it’s on! For those who hate annoying noise, that’s a definite plus. The GermGuardian isn’t bad by any means. The biggest difference is that the ultra-quiet noise level of the LV-H132 comes with a price. Because the fan speed is low for low noise, the air flow rate is much lower than the AC4825. Hence, the room size coverage recommendation is only 86 square feet. The AC4825 on the other hand has two internal fan sections which can move more air much more rapidly (and hence are better for larger rooms) but produce a bit more noise. Additionally, due to its design, the AC4825’s electronics produce a tiny bit of “whirring” noise from how it drives the internal electric motor when in use. It’s a very minor detail, but I like people to be aware before buying. As I’m very picky and have good hearing I can hear the difference. However, I’m still very happy with my AC4825. It produces a nice, steady sound similar to white noise that’s hardly noticeable in practice. I did notice that you need to give it some time in use before it breaks in and can actually become more pleasant-sounding. Here’s a pretty good summary of the fundamental pros and cons of both models. Take what you will from it – it’s not a perfect list, but I’ve tried hard to incorporate everything you should know before making a buying decision. I totally understand how it can be difficult. 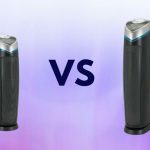 After all, they’re nearly priced the same and if you’re new to buying an air purifier, you might not even know which is best for you. 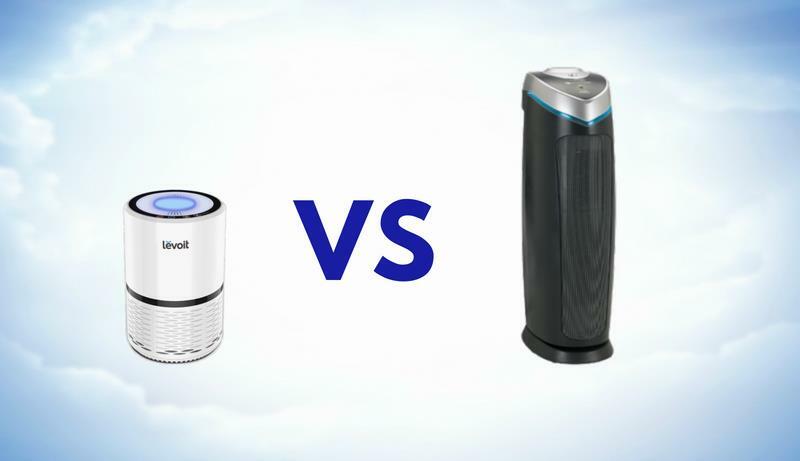 Ultimately, they’re both excellent air purifiers backed by thousands of happy buyer reviews. As I own both of them and have personally tested each, I’m confident you’d be happy with either one. Have look for yourself! Great for rooms up to 89 sq. ft. Excellent for bedrooms! A super-popular purifier that's a best buy, too! If you’re seriously considering the AC4825, read my detailed and honest review of it here before spending your money! You can also find out more about the AC4825’s twin, the AC4900CA, here in my AC4825 vs AC4900CA detailed comparison. Hi Craig! Yes, I sure do still own not just the AC4825 but also several other models much like it. Also, yes I’m aware of those reviews regarding a burning smell. While it is technically possible for nearly any electronics that drive a motor (like purifiers do) to overheat, burn out, or etc I’ve not been concerned at all. I’ve had absolutely no issues with mine. I also own several other GermGuardian models with a similar design too, and they’ve all done very well. The quality seems good in all cases. I wouldn’t recommend anything I didn’t personally believe in or had safety concerns about. That wouldn’t be right. From what I’ve seen, researched, and learned, the number of complaints were incredibly small compared to the great reviews. I can’t help but wonder under what condition those in the bad reviews were used. Sometimes buyer reviews are very suspect and they don’t tell you the whole story, unfortunately, so it can be hard to know the facts. They’re both great purifiers with pros and cons for each, depending on what you want and need. Maintenance is a bit less and the overall value is better for the GermGuardian in my opinion, however. Now that both models are available in both black and white versions they’re even better. Thanks for stopping by and especially for the comments. It’s appreciated. Hi Marie and I’m glad you found my post helpful! I have looked into the models like the CDAP4500BCA and the CDAP5500BCA, but I have not yet personally tested them. Regarding those, I do see a few complaints about the WiFi function and using it with Alexa as well, so if you’re a heavy Alexa user I would consider that before buying and expect to rely on the app instead. Overall, my impression is that they’re pretty good but have some room for improvement in those and the auto-sensing features. Still, the CDAP4500BCA is nice and a good value. I would expect similar for the CDAP5500BCA. I expect you’d enjoy the CDAP5500BCA if those things I mentioned aren’t an issue. As far as the actual air purification features you’ll be satisfied with that. These models are essentially the extra features built on top of the more basic models, so you can depend on the air cleaning ability.